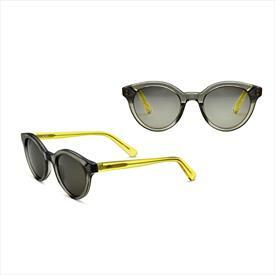 The MINI Sunglasses Pan to Color Block show a modern take on the classic Panto shape and are the perfect accessory for the modern urbanite. The hand-made frame is made of biodegradable acetate, 5-barrel hinges and has transparent, colored accent temples. Laser engraved tonal MINI Wing Logo on both temples outside, MINI Wordmark inside. High-quality, anti-reflective and anti-scratch coated Zeiss lenses guarantee 100% UV-A/UV-B protection. White cleaning cloth with black MINI Wing Logo. Handmade in Italy.